Should You Add the OPI Foot File to Your At-Home Pedicure Tool Kit? Does the OPI Foot File Really Work? The OPI Foot File is supposedly the same one you see in salons, and is reported to take off lots of dry, dead skin and calluses from your feet. Taking your foot care into your own hands is a great way to save money, and make sure the job gets done to your specifications. It’s also something that’s nice to do in order to keep your feet properly maintained between salon visits. That way when you do get a pedicure you can focus on being pampered and not on how much dead skin is coming off your feet. The foot file is probably the most important tool for keeping your feet healthy and feeling good. If you’re assembling your own at-home pedicure kit, this is one item that you’ll want to get right. There are a few different ways to file your feet, so it comes down to a matter of preference. There are shavers, which present the biggest opportunity to hurt yourself, graters that are designed to grate the dead skin off and leave the good skin behind, and there are also files that work to sand off the bad skin. Each has their benefits and drawbacks, so it’s really up to what you like best. The OPI model uses the sander approach, and buffs the rough spots off with a gritty surface. The OPI Foot File has a pretty basic design, but there are a few features that you might not notice at first glance. It has a very large working surface which is about twice the size of ordinary files. This allows you to tackle more of the foot at once, so you can finish more quickly, or take on bigger calluses. It comes equipped with two different grits on it so that you can switch it up depending on whether you want to file down calluses, or buff things for a finish. It also has a handle that is easy to hold onto, and it can be snapped off and snapped back onto the other end of the file depending on what you need. They say that you can quickly reduce or smooth down your calluses, and this is really being sold to salons, so you are sort of cutting out the middleman. They claim this is the best tool for the task. The hype comes from being able to spot this file in actual salons. It’s professional grade, so you can get the same results in your own at home for a fraction of the price. Some salons sell this as well, but they up the price so you can get a better deal by shopping online. You can pick up an OPI Foot File for about $15 from Amazon. It’s important to note that the grit will eventually wear off at some point, so you will need to purchase it again in the future. Of course, you’ll have to put in a little more effort than you would if you got your nails done professionally, but that is the trade-off for saving so much money. Compared to ineffective files, this should save you time doing it yourself, so it’s all relative to what you compare it to. People are loving the OPI Foot File, and they say that it gives them the same results that they expect to see from the salon. Their are a few detractors that say it wasn’t what they were looking for, and it has that sandpaper feel to it. So if you’re looking for something that does more for grading job, you should consider the Ped Egg, or the Microplane brand, both renowned for their grating ability. The best way to go about this is to replicate the steps they do in the salon. Should soak your feet first, which softens up the skin and gets it ready to be removed. Next, spend time on each foot getting the big patches first. Clip your toenails if necessary, and file the nails as needed. From there you can use a fine buffer to go over all of the areas that used to have calluses. Finish off with a healthy dose of your favorite foot cream and you’ll feel like a million bucks. It’s way better than thinking of it as a chore that you have to get done. 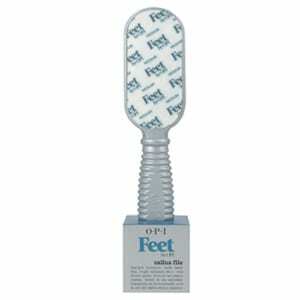 The OPI Foot File gets good reviews, and gets good results, so we’re giving it the green light. It’s a reliable file, and will round off your do it yourself kit nicely. Be sure to add a well- reviewed foot cream to your arsenal, because it helps keep your feet smooth in between filing sessions. If you approach this the right way it can be some serious me time, and you can forget about whatever other stresses you have going on that day. This is a pretty good foot file, and their easy grip handle is nice, but if you want something even more ergonomic to hold then we would suggest going with the Ped Egg. This has gotten a lot of good reviews, does basically the same job, and keeps things cleaner because it catches all of the dead skin that comes off your foot while using it. Also, you only need to buy it once. That’s one drawback to the OPI model, it just sends everything flying, and will eventually wear out. What do you think? Does OPI Foot File work or not? Does Revitol Stretch Mark Cream Really Work? When my nephew pointed out to me that I have ugly cracked heels, I knew it was time to do something about it. I was all set to purchase the Ped Egg, but found that the OPI foot file actually comes with a handle. I won’t go and get a pedicure because my feet are too ticklish. I bought the OPI foot file online and gave it a try. At first I wasn’t applying enough pressure and thought that I bought a useless product, but once I applied pressure it really did work! In fact, it created a mess on my bedroom floor. I would suggest keeping a towel on the floor to catch the dry skin. As far as foot files go the OPI Foot File, like the rest of its products, appears to have all of the right features to create a success. The file texture is obviously the most important part as it will either work great or fail miserably, depending on its roughness. A feature that I particularly love about this foot file is that it has a sturdy handle that is long enough and comfortable enough to make the filing easy. If it is just a big block of file, it can be difficult to get things done. OPI Foot File is a definite recommend! Love my OPI foot file. Easy to use. Easy to clean. Easy to travel with. My heels have never looked better!! It’s now on my “easy” gift list. Men like it as much as the women. Thanks OPI.